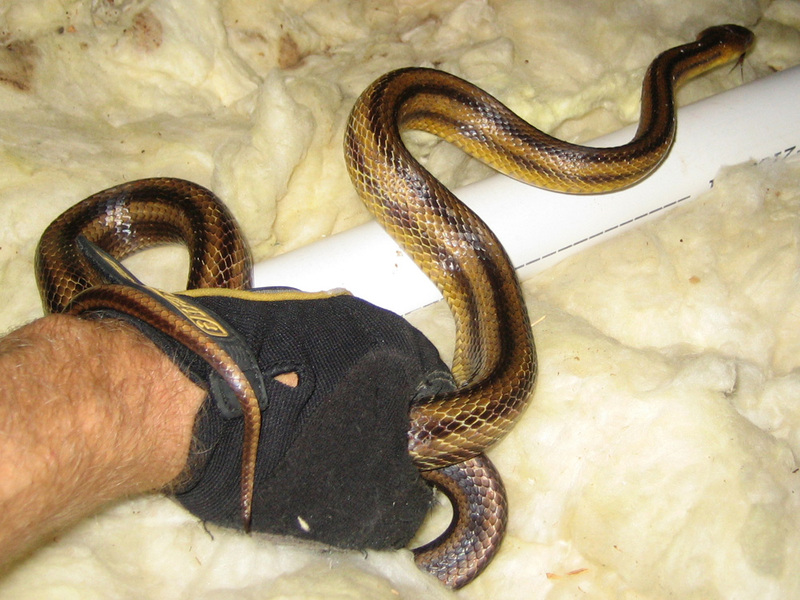 We specialize in the removal of nuisance snakes from property, homes and buildings in the Cincinnati area. We offer a wide variety of services from attic inspections to damage repairs, and can resolve any human-wildlife conflict. We are fully licensed and insured in the state of Ohio, owner-operated, and fully proficient and equipped to handle any critter problem, start to finish. Please give us a call at any time and we will listen to your snake problem, explain your options and our pricing, and we will schedule an appointment. Hi, I went to your website to get information about snakesin USA – Very informative web-site; Thank you very much for very god information. 5 years ago we found a snake skin just adjacent to our patio where we enjoy to sit and relax and also to do some grilling while we enjoy the outside where we have a small creek just 20 yards away. We found a hole in the ground under the stairs only a couple of feet away from where we found the skin which was 3-4 feet long. We removed the skin, filled the hole with concrete and forgot about the whole thing. Yesterday we found a new skin at the exact same place – also 3-4 feet long. But now we realize that we need to find out what type of snake it is. We recognize a new hole in the ground, very close to the old hole – it looks like it leads in under concrete stairs that leads down from the patio. Do you think the snake has built a nest there? You write on the web site that you might be able to identify what snake it is with a picture - I included some – hopefully you can tell me what it is. If not – I can send you the skin, if you give me your address – I could not find that on the web-site. Thanks in advance! We operate a professional snake removal company operating in the Cincinnati area, including the towns of Covedale, Delhi Hills, Norwood, Maderia, Kenwood, Montgomery, Loveland, Sharonville, Springdale, Forest Park, Northbrook, Groesbeck, Brentwood, Mount Healthy, Finneytown, and more, plus Northern Kentucky, including Covington, Newport, and more. We specialize in the humane removal of snakes from buildings and property. We are fully licensed and insured, and operate 24 hours a day, 7 days a week. Call us at 513-906-4260.